New Way®, a leader in the US and international refuse truck market, continues to see sales increase around the world. Last month, New Way® CEO John McLaughlin and his wife Karine made a special journey from Iowa to visit the sanitary officials of Lhasa, Tibet. The McLaughlins had first visited the New Way® China factory in Xining before embarking on a 24 hour train ride toward Lhasa. As the train rose to elevations over 14,000 feet in this region known as “the roof of the world,” it seemed to represent to McLaughlin how far New Way® has come in China over such a short time. In 1998, New Way® became the first American garbage truck to roll down the streets of China. Because of its reliable and economical design, its technology was quickly in high demand. The New Way® China operation grew to establish two joint ventures in the country, and is now known as the leading manufacturer of garbage trucks there. The locations in mainland China now act as the base for all of New Way®’s sales in the Far East. The operation’s production capacity is currently over 2,000 trucks annually. 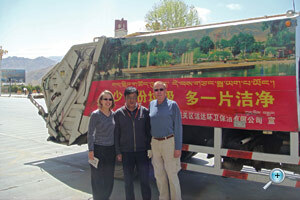 In 2008, New Way® sold 280 trucks to the City of Beijing for cleanup before the 2008 Summer Olympic Games. Arriving in Lhasa, the McLaughlins found a very warm reception. The officials were pleased to host folks from New Way®, showing off their fleet of 30 New Way® trucks adorned in pro-environment graphics. They revealed they had just ordered another 30 New Way® trucks to add to their lineup. John and Karine were happy when the officials said New Way® is considered the best garbage truck in China because of its good hydraulics and ease of maintenance.